Mission Crossroads 11 in which they are serving. We value the perspectives and experiences that diverse mission co-workers can offer. For instance, Cathy Chang writes in this issue of Mission Crossroads (pages 14–15) how she and her husband's separate, personal experiences of forced migration have helped them serve with people impacted by issues of migration and human trafficking. Our mission workers' various cultural backgrounds, language sets and race bring a richness to God's mission that we seek in our mission candidates. For more information, visit pcusa. org/msr or contact Mission Personnel at onedoor@pcusa.org or 800-728-7228 x2530. Rachel Yates is associate director for program in World Mission. S cott Parker used the word starving to explain how he and his wife, Elmarie, chose to serve in Syria, Iraq and Lebanon. Some may find it hard to believe the Parkers deliberately sought appointment to a location rife with violence. But such is the discernment process with World Mission, a ministry of the Presbyterian Mission Agency. Candidates with a hunger to serve in God's mission apply out of varying senses of call. Some have substantial international experience already and want to formalize the capacity in which they've already been serving. Others apply timidly, not knowing whether they are ready for mission service. In all, we recognize the application is part of a three-way discernment process involving the applicant, World Mission and the global partner with which the mission co-worker will be serving. e process can take many months. It includes the articulation of the applicant's sense of call, examination of the work experience and education, physical and psychological testing, and multiple interviews. Once accepted, the orientation phase begins. e process is designed to ensure that the candidates are equipped and prepared for service, typically four- year terms. Mission co-workers are not all teaching elders and seminary graduates. In recent appointments, we've hired a truck driver, a farmer, a teacher and an artist. In God's mission, the opportunities for mission service apply to all. Our mission is both proclamation and service and focuses on the work that Jesus began: sharing the Good News, addressing the root causes of poverty and seeking reconciliation in cultures of violence. We are grateful for the increasing racial-ethnic diversity of our mission co-workers and long-term volunteers. More than one-quarter of our mission personnel are people of color. Of the last nine appointees, only two were Caucasian. 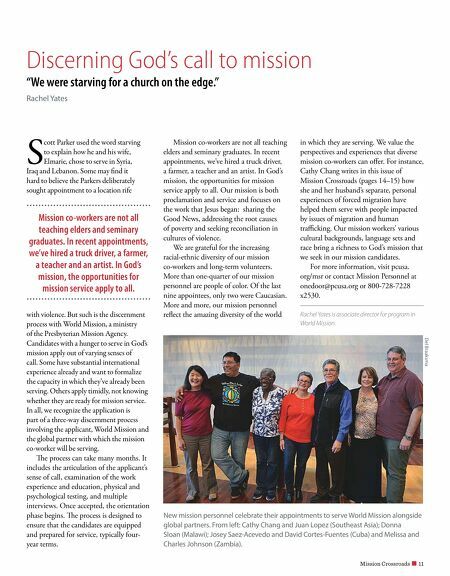 More and more, our mission personnel reflect the amazing diversity of the world Discerning God's call to mission "We were starving for a church on the edge." Rachel Yates Del Braaksma New mission personnel celebrate their appointments to serve World Mission alongside global partners. From left: Cathy Chang and Juan Lopez (Southeast Asia); Donna Sloan (Malawi); Josey Saez-Acevedo and David Cortes-Fuentes (Cuba) and Melissa and Charles Johnson (Zambia). Mission co-workers are not all teaching elders and seminary graduates. In recent appointments, we've hired a truck driver, a farmer, a teacher and an artist. In God's mission, the opportunities for mission service apply to all.